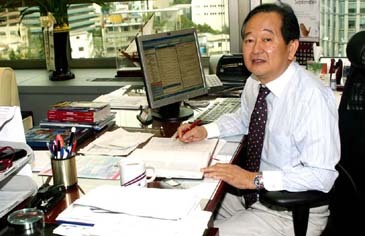 Mr. Lawrence Liew Kok Cheon, Korea area manager of Qatar Airways, works at his office in Seoul. 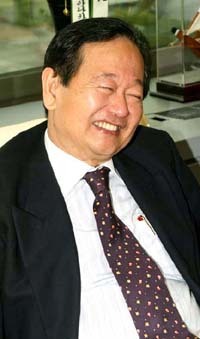 Mr. Lawrence Liew Kok Cheon, Korea area manager of Qatar Airways, is one of the airline experts with plenty of experience in airline management and marketing. 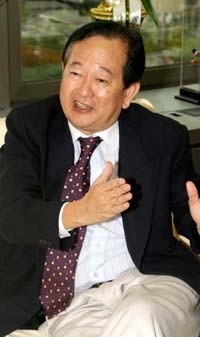 After dedicating decades of his life to Singapore Airlines Mr. Liew took up his top position as Qatar Airways' Seoul area manager at the start of the year 2006. 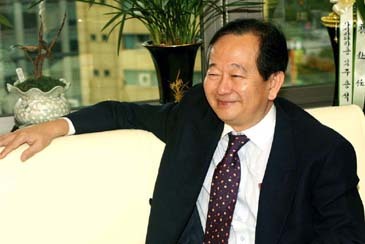 The Seoul Times recently met with Mr. Cheon to find out his own managerial skills and how he plans to expand Qatar Airways' business activities as well as his own story. The following are the questions and answers with Mr. Cheon. 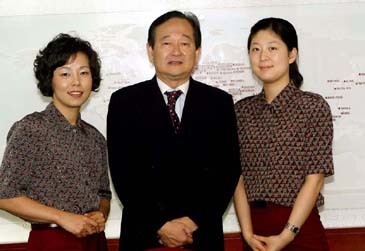 Q1: First of all, we would like to congratulate you on your inauguration as Korea area manager of Qatar Airways. Since your arrival in Seoul what have you been doing for your airways? Could you please explain about the general situation of your Seoul office including the number of your staff? A1: Thank you for your congratulations although I must clarify that Qatar Airways has been operating into Seoul since 2003. But in terms of a posted staff, yes this is the first time Qatar airways has sent a posted staff to take charge of the sales, administrative and general operations of the airline in South Korea. Since my arrival, we have been creating a greater awareness of Qatar Airways by way of publicity and advertisements, and trade seminars for the industry. More agents are also serviced by our sales team and cooperation between Asiana Airlines has been enhanced through code-sharing alliance. Our operation here is still very much a GSA operation, although we have our own QR staff numbering about ten to handle the airport as well as accounting and administrative functions. Q2: How many flights do you have per week currently? What types of aircraft do the use for the Seoul-Doha route? Do you have plans to increase your flights or expand your routes? A2: Currently we are operating every Tuesday, Thursday and Sunday from Doha to Seoul, with a short transit at Shanghai and vice versa. The aircraft that we are using is the new state-of- the-art Airbus 330 -200 series with a configuration of either 22 Business class and 259 Economy seats or 24 Business class and 248 Economy seats. With effect from 30 October 2006, we will be mounting the fourth frequency every Monday to cater for the increased demand for seats from Seoul to Doha and beyond to Africa, Middle East, Europe and the Indian sub-continent. Hence it will then be Mon, Tue, Thu and Sun, departing Incheon at 2230hrs and arriving Doha at 0640 hrs, the following day. You asked me for my plans. Our sincere hope is that by year 2008, Incheon will be serviced daily by Qatar Airways on a non-stop and direct operation. You may have read too that Qatar Airways has just taken delivery of the world's longest plane, the Airbus A 340- 600 series. Armed with this, Qatar Airways aims to fly non-stop to USA from DOH, as well as to key cities such as London, Osaka and eventually Melbourne in Australia. Mr. Lawrence Liew Kok Cheon, Korea area manager of Qatar Airways, is being interviewed by The Seoul Times in Seoul. In addition, we are the fastest growing airline in the world with 70 destinations and a fleet of 49 aircraft (all Airbuses), and that by the year 2015, Qatar Airways will have a fleet network to more than 100 destinations and expand to 110 aircraft. Q3: Please tell us about your customers. Who are the major customers of your airline? How many of them are foreign nationals or local Korean people? A3: Our customers comprise returning Koreans and the many nationalities that use our services to fly into Korea from Europe, Africa, the Middle East and the Indian sub-continent. I am now embarking on a campaign to bring in more tourists from South Africa as well as from the Mediterranean cities. I am happy to note that, and you can confirm this with the Korean Tourist office, more and more visitors are visiting Korea. For our outbound traffic, we of course carry Korean pilgrims to the holy land and the usual backpackers and trekkers to Africa and Europe, plus a number of honeymooners to the lovely islands of Maldives. Businessmen also make use of our extensive network to fly into Africa (Khartoum in Sudan and soon to be launched, Lagos in Nigeria) – all these in line with President Roh's vision of expanding on energy and resource development in Africa and the Middle East. Q4: How would you rate the overall quality of your service in particular in-flight service compared with other Korean or foreign airlines flying to Seoul? A4: Qatar Airways is one of only four airlines in the world with a Five Star ranking for service and excellence awarded by Skytrax, the independent aviation industry monitoring agency. Skytrax also named Qatar Airways' cabin crew as Best in the Middle East for the fourth year running in 2006 and second best worldwide following a survey of more than 12 million passengers worldwide. Qatar Airways averages just under 40 percent annual growth in both passenger numbers and revenue. For the financial year that ended in March, Qatar Airways carried more than 6.3 million passengers worldwide. Q5: Do you have any Korean staff, cabin crew members in particular? If so, how many Korean stewards or stewardesses you have? How do they cooperate with the staff from your headquarters? How do you train them? A5: Yes, not only do we have Korean cabin crew but we also have Korean technical crew on board our flights. At the moment we have over 200 Korean stewardesses in our employment and so far one Korean pilot. As you are aware, we regularly carry out interviews in Seoul to recruit the Korean ladies, famed of course for their sense of hospitality as well as courtesy. With the rapid expansion of the airline, I envisage that we will have more Korean stewardesses (and eventually Korean stewards). In general, Korean crew are well liked by the airline because they are very attractive, hardworking and seldom complain. All the training is carried out in Doha by our experienced crew who hail from Sri Lanka, the Middle East and Singapore. Hence, we put in quite a fair bit of investment in training the girls so that they can be better placed and prepared to handle any situation. Q6: Could you explain about your promotion strategy? Do you hold any events or whatever to further promote Qatar Airways' service to the local people? What are your PR plans? Mr. Lawrence Liew Kok Cheon, Korea area manager of Qatar Airways, poses for the Seoul Times with his staff in Seoul. A6: As we would inaugurate the 4th flight from 30th OCT, we would promote double Qmiles bonus for 4th frequency, meaning that the passengers get more mileage when they travel with us only on our Monday flights for a limited season. Also there are various promotion strategies such as our reasonable pricing and for the person who earns over 10000 Qmiles, he or she can fly on one of our partners Airline, Asian Airline, using the redemption ticket. You may have read that we sponsored the torch relay for the Asian Games when the special aircraft brought the flame from Doha, Qatar as it flies all over the Asian countries. In line with the new fourth flight on Mondays, we are going on an advertising blitz at the City Hall subway station as well as on 35 bus stations all over the key locations of Seoul. Very soon, by next week, we will be conducting an Agents' seminar to drive home the fact that Qatar airways will be introducing the new flight from 30 October onwards. Q7: A lot of airlines including foreign ones publish bilingual in-flight magazine to provide better service. What I mean by bilingual is in both Korean and in the official language of the country the airline belongs or in English. Do you have any plan for this? A7: We are now publishing only in Arabic and English languages for our in-flight magazine. However we have Korean newspapers and magazines for the Korean traveller. Q8: What would be the ideal airline service that could totally satisfy the air travelers? As far as you know, what are the characteristics of Korean travelers compared with other nationals? A8: One of the biggest inconveniences for air travelers is seating for a long period of time in limited space. QR has a generous seat pitch when compared with most airlines and there are many other entertainment facilities such as a screen on every seat. 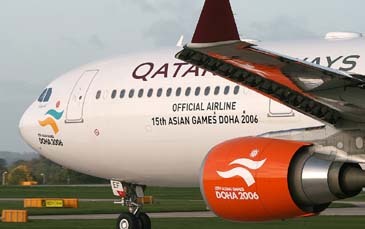 The aircraft used on the Seoul/Doha v.v. route is the brand new Airbus A330-200 or 300 series, depending on the flight dynamics, not to mention our high quality of cabin crew services such as Korean stewardesses to take care of the passengers' needs. I know for a fact that the Korean traveller is very comfortable only among his / her fellow passengers or his/her own airline. So we try to address his concerns and needs by catering to his / her taste buds with the introduction of Hansik for on-board meals. Q9: How long have you been serving in this line of business? On what occasion did you start working in this business? Were there any motivations? A9: I have been in the airline industry for over 34 years with Singapore Airlines before I thought it was time to hang up my boots. After two years of restless boredom in which I started a small pub in Singapore, there was a job offer from a new airline to help start up Cosmic Air in Nepal, which was my last station of posting with Singapore Airlines. After almost a year with Cosmic Air, Qatar Airways offered me a job as Area Manager South Korea to be posted to Seoul. I immediately took up the job offer as my wife and I like Korea. Moreover, my first posting with Singapore Airline was as a station manager based in Seoul, Korea. The airport used in 1980 was Gimpo airport. Korea has come a long way since those days. Q10: If you don't mind we would like to ask some personal questions. Please explain about your family. Do they live with you in Seoul? What do they do for a living? What are your hobbies? A10: My wife and I are presently residing in Seoul while our children, a boy (Jonathan) and girl (Laura) are studying in Australia (Melbourne and Perth, respectively). Reading music remain my favourite hobbies, although I try my hand at golf, since they say that it is the only sport that allows a man in his 60s and 70s to continue participating. Qatar Airways, the national airline of the State of Qatar, is one of the aviation industry's success stories. The award-winning airline is one of the fastest growing carriers in the world with unprecedented expansion averaging almost 40% year on year that industry peers can only admire with envy. Since its relaunch in 1997, Qatar Airways has achieved staggering growth in fleet size and passenger numbers. From only four aircraft in 1997, the airline grew to a fleet size of 28 aircraft by the end of 2003 and 47 by June 2006. By 2015, the fleet size will almost triple to 110 aircraft. From its hub in Doha, capital of Qatar, the airline has developed a global network of destinations served, covering Europe, the Middle East, Africa, Indian subcontinent and Far East. By the beginning of 2005, Qatar Airways flew to 56 destinations, rising to 70 by June 2006 – its newest routes being to Nairobi, Madrid, Berlin and Hong Kong.